Peanut allergy in children can be life-threatening, with safe treatment options available. Now DBV Technologies in Paris has a phase III transdermal patch which desensitizes the patient to peanuts, with fast-track FDA approval. 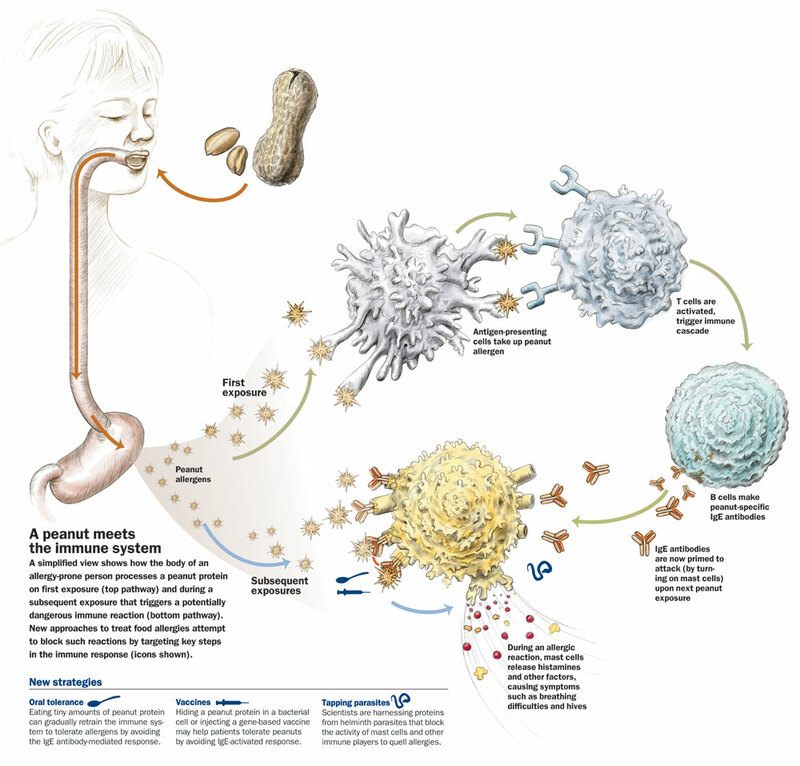 The allergens in peanuts can stimulate an immune response to their presence, which can even result in life-threatening anaphylaxis (here is a great infographic demonstrating the reaction). The Viaskin Peanut patch is the DBVs lead product candidate based on epicutaneous immunotherapy (EPIT), a proprietary technology platform that can safely deliver biologically active compounds to the immune system through the immune cells of intact skin. This means that small quantities of peanut allergens are allowed to be absorbed transdermally via the patch in a small built in air pocket where moisture condenses (permitting better absorption). Langerhans cells are attracted to the allergen in this outermost layer of the skin and transport it to the lymph nodes, where a gradual desensitization process can take place. Now, the phase III safety and efficacy trial, dubbed the Peanut EPIT Efficacy and Safety Study (PEPITES), will enroll around 330 pediatric patients with peanut allergies to see if the Viaskin patch can really reduce these children’s reactivity to these allergens. So this is bit in the Immunotherapy field, and a possible end to peanut anaphylaxis is like the Holy Grail in Allergy research.